I want to go long term cruising. I have thought about getting a Jeanneau 490 or 51 but the price to upgrade is 400k for a 490 and 500k for a 51 if I go new again. Then, I'd still need a bunch of work to get them ready to cruise. That's a lot of money for the extra room which would be nice but it's not like the 439 is small. So, instead, I decided to keep the 439. There are just 2 of us 99% of the time regardless. I contracted Maine Yacht Center in Portland Maine to do the following work. We swapped the aft sbd water tank for a diesel one and installed NMEA fluid level sensor to accurately report fuel levels to the plotter. The stock water tank is not suitable for diesel and Jeanneau don't make a sbd fuel tank so one was fabricated. We installed calibrated NMEA tank level sensors for fuel tanks. The stock factory ones are basically garbage. The tanks are irregularly shaped so these have 5 calibration points to ensure much more accurate readings that are visible on the plotter. Motoring range improved dramatically on the boat. I can run the 57hp yanmar at 1.5k rpms and it burns about 1.5L/hour at 6 kts. The boat now has 400L of diesel which translates to a motoring range of 1600nm. This requires racing the engine every 2 hours per the Yanmar manual to avoid carbon build up. Running at a more normal 5L/hour at 7.5kts, it's about 600nm. The tanks use a new manifold to join run or use either one independently. They feed to the stock Yanmar fuel filter lines. The boat had two water tanks, an 87g fwd and a 50G aft one. We have the one 87G tank now with a watermaker. I also added a Racal 500 dual polisher which uses the new fuel manifold. It's not inline to the engine yet. It can polish the fuel from one tank while using the other. It can also transfer fuel between tanks. We added 1150W of Solbian SP1 solar. This was added to the bimini, dodger and deck of the boat. About 750W on the bimini/dodger and 350W on the fore deck. Each has a controller to minimize shading impact. This should generate between 300 and 500aH of power daily (we'll see in practise) depending on conditions. They use a combination of genasun and Victron solar controllers (depended on max voltage from panel strings). 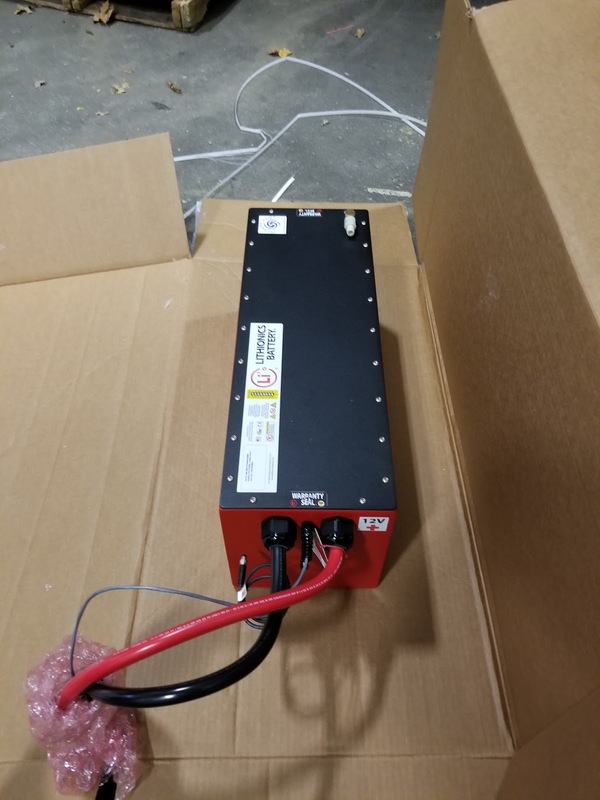 2 x 12v600aH relion batteries each with a BMS. The engine and bowthruster batteries (AGM) are charged with a DC-DC smart charger from these. Each 600aH battery is independent for redundancy. 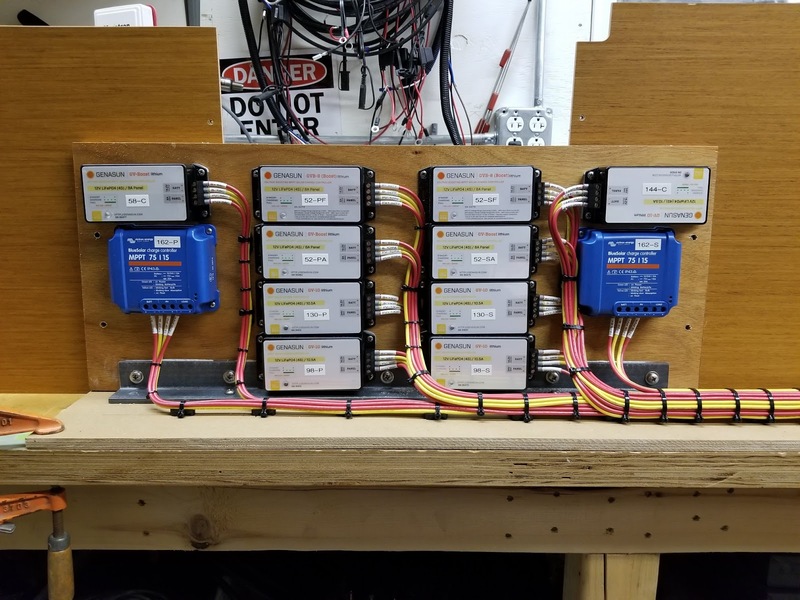 A parallel switch was added to allow the engine/bow batteries to also use lithium if needed. 360A alternator with Balmar smart regulator. This lets us charge lithium batteries from the engine if necessary with minimal run time. It's derated at 300A per hour. The cooling for the engine compartment was improved to handle the heat. The alternator is physically the same size as the old one but needs new pulleys and belts. There is a cockpit switch to disable it for low RPM motoring. One of the Victron 3000kw/120A invertor chargers. The boat uses about 186aH daily at anchor (no air con loads). I have a dometic dual 95L fridge/freezer on the boat also. The boat burns about 230aH daily sailing. The 1200aH gives a usable 1000aH which is basically 5 days sailing with no sun. Most days we expect to discharge them to 80% which means the life cycle times on the batteries are in the tens of thousands of cycles. 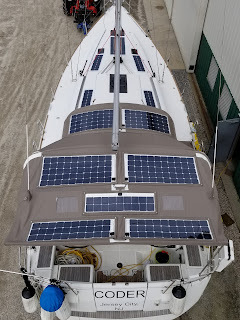 The Solar panels should generate more than this typically so the boat would be fossil fuel free when sailing OR at anchor. Worst case, we start the engine and are charging at 300A per hour minimizing run time. 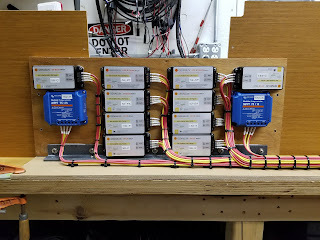 All 3 Air units (16K and 2 8K dometic units) share their own inverter. We will likely just use either the 16K or a single 8K in practice when anchored or sailing. They can both heat (water temp > 40F) or cool the boat. At water temps < 40F, the boat has a Webasto 5500 powered by diesel. Village Marine 145GPD 12v water maker. This is mounted under the fwd bed with a sample tap in the fwd head. 6gph which isn't great but it's compact. It's above the fwd berth large drawer, sample tap is in the fwd bathroom and the thru hull is just forward of the keel. Bruce Schwab from ocean energy and I hatched the project and Steve Ecker from Maine Yacht Center designed/installed the system. 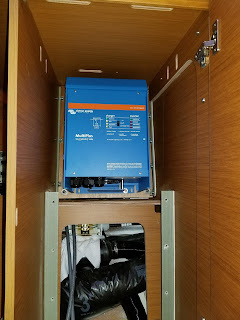 I gave up half the hanging locker in the port aft bedroom to house the invertors. The cabinet had cooling installed. Doing this wasn't cheap but the boat is pretty transformed as a result in terms of range and comfort under way or at anchor. The goal was to minimize/eliminate consumables (diesel and propane). We will use electrical appliances for cooking. 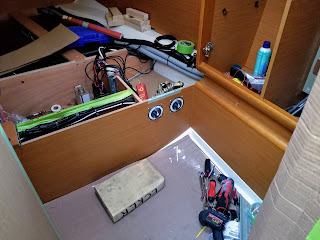 I am thinking of removing the propane completely which frees up the sbd aft locker for storage/systems access and we can remove the stove/oven and replace with a gimbaled counter and storage. An instant pot, electric grill and kettle will likely be the most used cooking appliances with a camping stove and our magma as a backup. The work is top notch (Bruce and Steve are pretty amazing) and the lithiums are as safe as it's possible to make them. All work is to a very high standard. After making this investment, I think our Jeanneau is pretty much one of a kind right now and I can't wait to go cruising on it. The work is in the later stages of completion now and I'm hoping to pick the boat up in April (winter got in the way) and use it. Both my quiet flush jabsco toilets have leaks waste in to the bowls basically since I got the boat. This is the most annoying thing since the holding tank leak. I purchased the minor service kit for my electric toilets and swapped only the joker valves. This wasn't so bad. First, put a lot of fresh water in the bowl and flush it. Jeanneau actually has what seems like a good design here. They use a second joker valve above the standard toilet one. This is supposed to lower the pressure on the toilet joker but also means when you disconnect the hose at the toilet then you don't get the whole pipe contents spilling on the floor. Anyway to cut a long story short, the valve were pretty easy to swap out but a little boat yoga is required as the screws are tricky to get at. The replacement joker valves worried me as I'd read that if you can see any light through them at all then get them replaced but both jabsco and Defender.com both said that's rubbish and I gotta say after 2 weeks of using the valves that I could see through that they are right. The toilet backflow is much improved. The valves I took out had maybe 1/4 inch of a gap, and the new ones looked much better. The fuel level sensor that comes with the boat is pretty inaccurate. I'd only trust it to tell me the tank is either full or empty and don't trust it for anything in between. The problem is the sensor is linear but the tank is irregular so the readings on the guage in the cabin are just plain wrong except when it's full or empty. I purchased a Lowrance NMEA fluid level sensor. This attaches to the sender on the fuel tank and your NMEA bus. On my 439, there is a NMEA point just in front of the tank on the port side where the autopilot computer is mounted. You will need a sim-c to NMEA convertor cable and then it's pretty easy to install. I crimped some female spade connectors to the red and black wires, disconnect the stock wires from a plug on top of the tank, attach the new spades instead of boom, it's installed. It gets picked up automatically by the chart plotter and I could configure it. You give it a name, provide the tank capacity and then you can look at the "data". My tank is about 7/8 full, the sensor shows 33%. The problem is the sensor is configured for a US sensor which is 240 ohms empty to 33 ohms full. The sensor is not a US sensor, it's a European one. They decided to do 10 ohms empty, 180 ohms full. So, 33% means 66.1 ohms (180-10)*.33+10. This translates to 33/(240-33) or 85% full with a US sender which is about right. I've been getting condensation under the fwd mattress when I sleep on the boat. The wood under the mattress gets pretty wet and I started lifting the mattress up during the day to let it dry. I tried using a flooring materiel between the wood and the mattress but while it kept the wood dry, it trapped the moisture between the sheet and the mattress so the mattress stayed wet. I then purchased 14 ft (it's about 4ft wide) of hyper vent. This is a breathable "paper" with a stiff plastic weave about 3/4 inch thick underneath the paper. I cut this to fit the v-berth and tried it out. The mattress and the paper stay dry but the moisture still collects on the wood. I don't think I have enough air flow to move it away during the night. So, I saw a video of a cat which had small circles cut all over the boards over the water tank and a small computer fan in the front panel to pull air out of that space under the bed. I think I'll try that next and hopefully that will fix it completely. I'm continually getting trouble with my Webasto 5500 which won't stay on. It shutdowns randomly with either a F1 (mostly) and F2 code. The diesel tank is full with fuel from auto diesel stations. The trouble now is that the worst of the winter is still to come and my boat isn't winterized as I want to use it and live on it part time during this time. Heating the boat without a diesel heater. This basically means electric heat. The 439 has all A/C sockets on a single 15A ring/breaker. The micro wave is on the same ring. This means if we have a heater turn on then we need to turn it off while using the microwave. We own 2 West marine 1500W heaters. They draw 10.3A maximum which is a long way from 1500W but that's another story. I can run both these heaters on the 15A ring at setting 3/4. This draws just under 7A per heater and results in more heat than one heater on 4/4 which draws 10.3A. The water heater appears to be on its own 15A circuit also. This is shared with the battery charger I think which is a 60A unit. This means 6A is pushing full power. The water heater is plugged with a euro style plug in to a socket behind the galley couch back (beside the water manifold). I ran a heavy cable from there using a Euro to US adapter and this lets me run this ceramic heater instead of the water heater. So, now we're at a 10A west marine heater and a 13A ceramic space heater. It isn't enough to keep the boat comfortable. I realized that I'm not using half my boats power. The boat has 2 x 30A shore power cables. One is for the boat and the other runs the 3 A/C units on the boat. I unplugged the A/C shower power cable. On my Jeanneau, the cable is a 50A 125V ending. I had to buy a 50A 125 to 30A 125 pigtail. Then I purchased a 30A to 3x 15A 110V socket which is protected. I can run another space heater from that. This puts me at a 10A, a 13A and another 10A. Dedicated 400W engine compartment heater. I also added a 400W 110V AC Caframo engine heater. This is a heater which turns on at 41F and turns off at 59F automatically. I installed it temporalily in the front of the engine compartment with zip ties for now. This should prevent the engine from having problems from the cold. This week, my Webasto stopped working. I noticed because the temps on my boat started dropping while I was at my house. 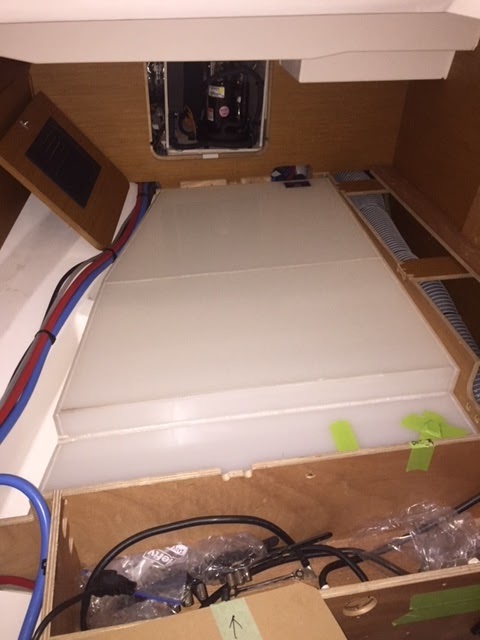 I have a samsung smart things setup on the boat to monitor for leaks and temperatures in different parts of the boat (bow, aft, cabins, engine, fridge) which sends me alarms when it's cold. When I got to the boat, there was plenty of diesel (1/2) but there was a flashing fault code on the control unit for the heater. I see 5 fast flashes and one long flash. The long one indicates the fault. One flash indicates "failure to start after 2 attempts". The manual indicates to restart the heater. I did that twice with the same result. Then I rebooted the boat (cycle 12V power) and got the same on the first try but it worked on the second try. The boat then heated up but today, like 3 days later, same issue I think. Headed to boat today to figure it out and possible see if I need to decoke the heater or replace glow plugs. Winter came. It was down below zero F during the last weekend and I got to test out the heating setup on the boat. I have a dealer installed Webasto 5500 on the boat. The reverse cycle heat that I was using isn't working now that water temperatures are 37F which is too cold to make any heat. So, these are turned off now until the water gets above 40f again. We knew the Webasto does not heat the boat uniformly. Most of its heat exits in the port AFT bedroom, the main toilet, the rest goes between the starboard AFT bed room and the main cabin. The forward toilet and the forward berth get almost nothing. So, the forward cabin went down in to the low 30s. The main cabin is around 50 and the rear are around 55F. The engine compartment was in high 30s. I did remove both side inspection panels for the engine allowing some heat to enter the engine compartment. I want to stay on the boat and this isn't enough heat for me. So, I purchased two Westmarine 1500W space heaters (99 bucks ea), one for fwd berth, one for main cabin. The Westmarine heaters are not putting out the heat on the box, 10.6A is around 1166 watts, not 1500W. Anyway, with the heaters and the Webasto, the boat is managing to keep 65-68F in the main cabin and 40s in fwd cabin so thats working for me. I sleep in the starboard AFT cabin which is cosy. The boat is warm enough to be in a t-shirt when its single digits outside. BTW, opening the engine compartment results in a good cold draft (not good) from the rear of the boat in the main cabin. I ended up just removing one panel rather than both panels from each aft berth.